18DogsADay is written by the manager of a small scale animal rescue in the middle of the UK, pulling dogs from pounds to be rehabilitated and rehomed as well as many other cats and small pets. Broken Souls Rescue has a strict spay and neuter policy and dog training & rehabilitation services to help prevent other dogs being surrendered into shelters. A “no kill” organisation, dogs with complex issues stay as long as they need to and receive whatever veterinary treatments they require, whatever the cost. 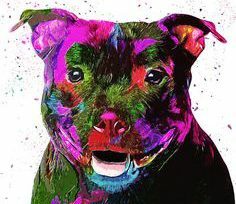 The Staffordshire Bull Terrier is the most commonly seen breed of dog across all rescues and pounds in the UK. The use of these dogs by young people in gangs for a symbol of status and use in dog fighting has created a negative reputation for the dog originally bred to protect sleeping children from rats at night. The SBT is a family dog who, like a human, with the correct upbringing can turn out to be a loving, loyal and trustworthy part of any family. Larger rescues such as the RSPCA and Dogs Trust actually set a limit of how many of this breed they will admit in their shelter kennels, despite the fact that this is the dog breed in need, they deem them “unadoptable” due to behavioural issues that simply require time, consistency and training. 18 Dogs are put to sleep, euthanised, killed…every day in the UK simply to there being no rescue spaces or homes to be adopted into. Everyone wants to buy a puppy from the internet. This funds backstreet and over breeding and leaves older dogs left unwanted in kennels. Until the UK stands up and faces the issue of 18DogsADay, i don’t think we should dare call ourselves a nation of animal lovers. Due to a lack of rescue space, over breeding and back street breeding, a lack of awareness and education; more and more dogs are being left in shelters, dumped and left unclaimed in county pounds on deathrow or put to sleep. Once on deathrow a dog has just 7 days during busy times to be claimed or rehomed...otherwise they are killed.